Throughout this summer we will have the chance to chat with some of the cast and crew of The Ring who make this operatic masterpiece come alive. 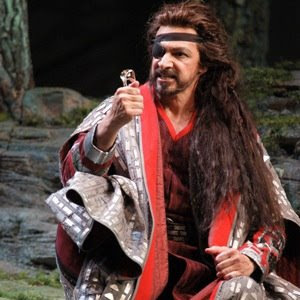 Today we are happy to have Greer Grimsley, bass-baritone extraordinaire, join us. This summer he reprises the role of Wotan, which he performed for the first time during Seattle's 2005 Ring. SG: Thanks for taking a break out of your busy schedule and joining us today. Since 2005 have you played the role of Wotan anywhere else? GG: Yes, I did the role in Venice and the Rheingold Wotan in a concert production in Indianapolis. SG: How, since your last performance here in Seattle, has your conception of the character evolved since 2005? GG: Well, it's still all there, but in a much deeper fashion now. The last time I was here all three operas were new. As an actor the goal is to find the actual feelings that this character is going through in any given scene and being as honest as possible in the portrayal. At the same time I'm always finding new things and seeing new layers. SG: He is one of the most complex characters, not just in The Ring, but in all of opera. Wotan has a broad range of emotions from almost youthful exuberance in Rheingold to a fatalistic pessimism by the end of Siegfried, how do go about creating all these different emotions? GG: Well it's important to always use the text as a lead and as an actor when you try to play the emotion it fails. Instead you have to give a true representation without that filter, you have to just be there in that characters shoes and translate your own life experiences. In the theater you have to use a piece of yourself, but not play the character for it's own cathartic experience, if you do the audience won't be able to connect to that experience. SG: It seems like working with Stephen Wadsworth would be an exciting process for that reason, since he seems to have a clear idea, but wants to get the most out of every singer as an actor as well. Would you agree? GG: Stephen always has a great beat on the story-telling. He brings his own ideas and we all do our best to realize those ideas. But we also bring our own interpretation and he'll catch us doing something and say, "I like that, keep doing that." It becomes a complete collaboration. It's interesting because the staging process is very similar to 2005, but with new people involved and our own growth it becomes an entirely new show. Stephen is able to bring all of this together; he takes the full picture of all these interactions, and he focuses them for the audience as if he were a film director behind a camera lens. SG: You mentioned that there are some new faces in the cast this time. How do you go about creating new dynamic relationships between Wotan and Loge (Kobie van Rensburg) or Brunnhilde (Janice Baird)? Similarly reviving partnerships whether it's with Stephanie Blythe as Fricka or Richard Paul Fink as Alberich? GG: The Fricka/Wotan scene in Walkure has grown in the four years since we last performed. It's become a more intense reading since Stephanie and I have both grown since then, and we've stayed in contact along the way, so it has been a lot of fun to delve back into those scenes. It's very exciting with all the new energy as well, it brings a number of new ideas to the scenes. SG: You've been involved with this project since 2001, how has it been to go from the role of Gunther in Gotterdammerung to Wotan? GG: I have been absolutely grateful to pursue so many rewarding opportunties in my life. I've never regretted any of the roles that I've played. The role of Wotan has been such a gift, it's like King Lear and Henry V all wrapped up into one. Wagner really created the idea of epic cinema and a full development of character. We've seen it with the films of The Lord of the Rings as well, and that sense of myth brought to life. I thought of the role of Gunther as a sort of 'apprenticeship.' In 2001, I was just thinking that maybe I'd want to take on the role of Wotan and it was really a gift to watch a talented performer like Philip [Joll] and watch him work every day. I can't thank him enough to have had the opportunity to observe and learn from him. SG: Can you tell us what a typical rehearsal day looks life for you during The Ring? GG: It can be pretty crazy. We are constantly shifting and we might do Rheingold in the morning, Walkure in the afternoon and Siegfried in the evening. The character is light years apart from the beginning of The Ring to the end of it all. It's a challenge at times. We'll finish a rehearsal and I'll have to find a quiet place for a few minutes in order to get myself to a place for Wotan in the scene we're going to work on next. Since it's a constant change and the character undergoes so much change it assures that I'm nimble and always prepared and it might spark a new idea, which only adds to the characterization. This interview also makes me regret I must be in Germany as English-texter and translater when the "Ring" will be done in Seattle. As for the Wotan-Fricka scene in Walkuere II, in Luebeck Fricka is the typical Base Commander's wife, and that portrayal is just as werktreu to Wagner's text and music as Stephen's is. Germany's biennial Federal Garden Show is this year in Schwerin (my main home), and I must transdlate for it and for the State Theater, which is doing more this summer than usual because of the additional tourists attracted by the Bundesgartenschau.